Carry your HP Pro x2 612 into the daily fray without worry. 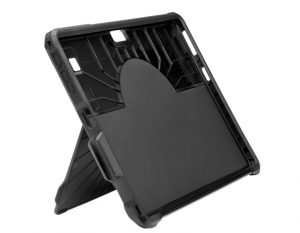 The sturdy and stylish HP Pro x2 612 Rugged Case helps shield your tablet from bumps without adding extra bulk and is designed to pass MIL-STD 810G testing. • Keep all of your tablet’s buttons, controls, cameras, and connectors easily accessible. Block unused ports as needed, or keep them clean, with the included plugs. Store your pen in the case’s pen holder. • Use the padded shoulder strap to keep your hands free. 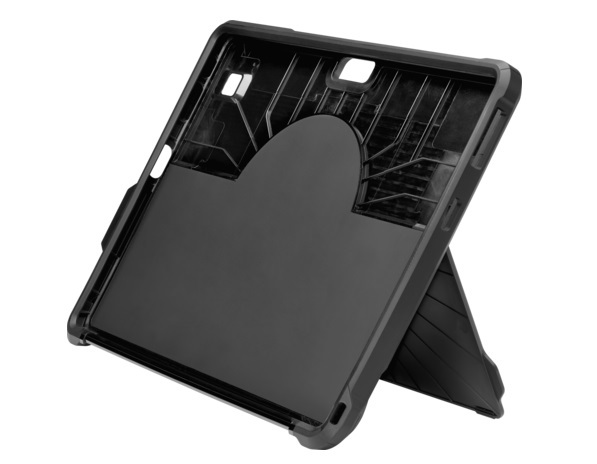 Flip the case open and adjust the easel kickstand up to 60 degrees for comfortable interaction with the tablet and keyboard on a desk or table. • Find your most comfortable setting for holding the case with the 360-degree rotatable elastic hand strap. Switch to the wipeable hand strap as your preference or workplace requires.